A half-full Johnson Coliseum met former President George Bush last night with a standing ovation, whistles and cheers of "I love you, President Bush!" 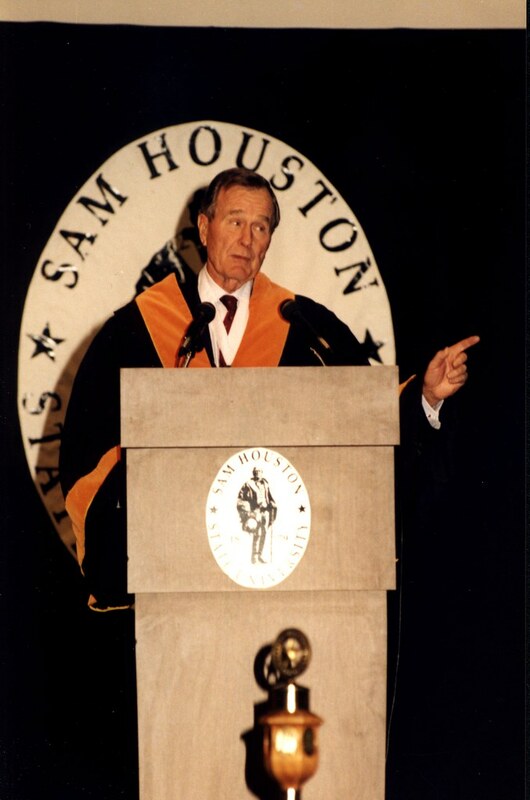 It was a positive and honorable scene when Sam Houston State University President Bobby K. Marks presented Bush, the nation's 41st president, with the third Sam Houston Humanitarian Award--an atmosphere different in all respects from the Karla Faye Tucker circus of last month. "I don't know that we've ever had a president or former president come to the community," Mayor Bill Green said, "so I think it's one of the most marvelous events of all time for our community. In terms of the uplifting nature, I think that it's a positive thing for the university and the community. President Bush is one of the most honorable men we've ever had as president." Bush received four standing ovations during the ceremony, which was attended by SHSU regents and faculty and community members, as well as state Sen. Steve Ogden and state Rep. Allen Hightower. "This is a most significant evening in the history of Sam Houston State," Marks said. "We are so very grateful that President Bush's life has been led in such a way that he can be used as a role model for our nation's young people. President Bush will be remembered not only for his great accomplishments, but also for the way he conducted himself in the discharge of his public duties. "When Sam Houston was a young man, his mother gave him a ring that bore the simple inscription 'honor'," Marks said. "President George Bush is the manifestation of the word 'honor'." Marks went on to list Bush's achievements in and out of office, including: leading the nation during the end of the Cold War and liberation of Kuwait, establishing the Americans with Disabilities Act and the Clean Air Act, and supporting over 150 charitable organizations along with wife Barbara. "As the leader of the free world, by the end of his term as president, he left us with the best prospects for world peace since before World War II," Marks said. Dr. Carol Smith, who chairs SHSU's Distinguished Lecturer Committee, described Bush as "part Sam Houston, part Abraham Lincoln, part Huck Finn, and even part Arnold Schwarzenegger." Smith also listed some of Bush's accomplishments as ambassador to the United Nations, chairman of the Republican National Committee, liaison to the People's Republic of China, director of the Central Intelligence Agency, congressman, vice president and president. "The life of this man defines service above self," Smith said. "We salute you as you have sought to be one of the ultimate stories of our national heritage--an architect bringing to the world order a chance for a level of peace about which we had only dreamed previously." Marks believes that this event, which was attended by over 3,600 people, will have a positive effect on SHSU. "We've never had anything at the university that has attracted so much interest in the community," he said. "Without any question, President Bush is probably the most important visitor we've had on campus." Earlier in the day, Green and other city officials joined Bush for a visit to the Sam Houston Statue Visitor Center. Bush learned about the statue and the visitor center from Green and statue sculptor David Adickes. He also laid a brick at the statue in honor of himself and Barbara. "He seemed to enjoy the visit," said Green, who described Bush as personable, charming, down-to-earth and humorous. "It was just a wonderful, warm feeling for everybody who could be there. It was a marvelous thing that I'll always remember." Marks agreed. "I was struck by how unaffected he seemed to be by his position," he said. "He was thoroughly down-to-earth."